TV listings and start times for Sunday’s Elite Eight games featuring Virginia vs. Syracuse in the Midwest Regional and UNC vs. Notre Dame in the East Regional. Is this the Elite Eight or the semifinals of the ACC tournament? Three of the four teams that were in that round of that conference tourney just two weeks ago in Washington D.C. are now on the cusp of the Final Four. No one is surprised that No. 1 seeds North Carolina and Virginia are in this position, but the other two teams, Notre Dame and Syracuse, are unlikely Elite Eight entrants that have taken advantage of some busted brackets to reach their respective regional finals. This de facto ACC tournament will round out the Final Four field in Houston, with the winners set to meet in the national semifinals on Saturday. That guarantees that the conference will have a team playing in the championship game on April 4. One of these teams is supposed to be here. The other, according to a lot of talking heads, shouldn’t have even made the field of 68, let alone be one of the last eight teams still playing this season. 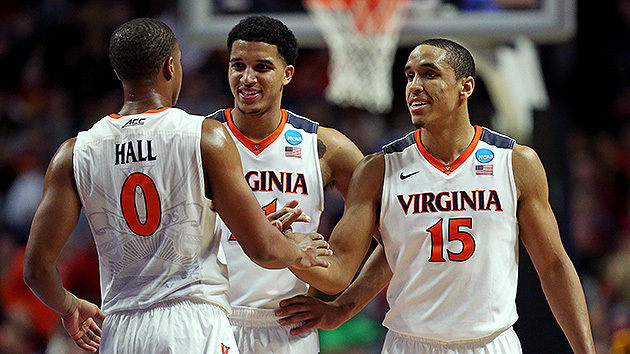 Nevertheless, Virginia and Syracuse have both made it to the Elite Eight. They met once in the regular season, with the Cavaliers earning a 73–65 victory in Charlottesville on Jan. 24, a game in which they handled the Orange's zone with ease by shooting 56.8% from the floor (25 for 44). Malcolm Brogdon, the ACC player of the year, scored 21 points that day, while forward Anthony Gill and point guard London Perrantes both had 16. The game was tied with 7:44 left, however, so Syracuse was in striking distance for the victory. If they’re going to get over the hump this time and pull off one of the biggest upsets of this tournament, the Orange will have to figure out a way to slow down Virginia’s offense, something they weren’t able to do in that regular season game. Notre Dame continues to find a way to win late in games during this tournament. After rallying from 12-points down at halftime to beat Michigan in the first round and getting a tip-in with 1.5 seconds remaining to beat Stephen F. Austin in the second round, the Fighting Irish overcame a three-point deficit against Wisconsin with 26.4 seconds left and won by five, 61-56, to reach their second straight Elite Eight. North Carolina, meanwhile, has been arguably the most impressive team in the tournament. After blitzing Florida Gulf Coast and Providence with dominant second-half performances in the first two rounds, the Tar Heels imposed their will against No. 5 seed Indiana for the full 40 minutes in the Sweet 16. North Carolina shot 51.6% from the floor against the Hoosiers, including an unexpected 11-of-20 from three-point range, and made 26 free throws in its 101-86 win. These teams split their two previous meetings this season, with the Irish pulling off a four-point win in South Bend on Feb. 6, and the Tar Heels getting a measure of revenge by winning their ACC tournament semifinal game by 31 points on March 11. That was arguably North Carolina’s best defensive effort of the season, as Roy Williams's team held Notre Dame to 30% shooting from the floor. Marcus Paige is coming off his best offensive performance in weeks, knocking down six of his nine three-point attempts against the Hoosiers and finishing with 21 points. That's his best game since he had 21 points on 5-of-8 three-point shooting against the Irish last month. If he shoots like that again, Notre Dame is going to have an awfully tough time keeping their season alive against a team that has more size and talent. Even if Paige cools off, it might require a near-perfect game for the Irish to notch what would be a sizable upset.